Then [after Jesus cleared the Temple of the money changers and animals] his disciples remembered this prophecy from the Scriptures: "Passion for God's house will consume me." What is your passion? 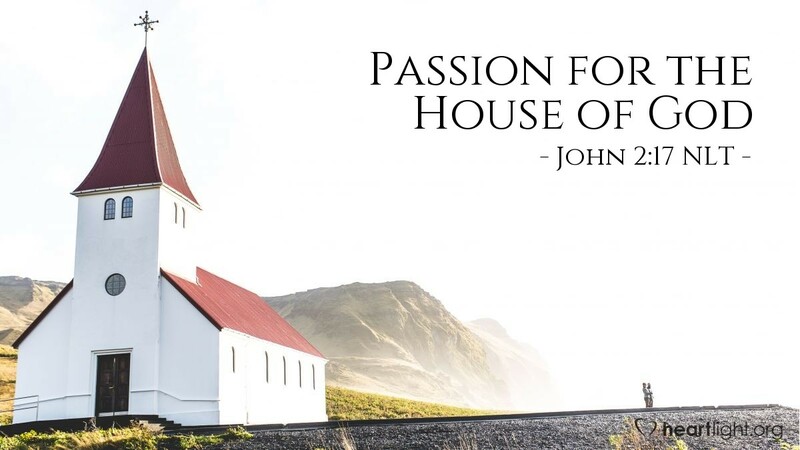 Is your passion for God's house, the temple where he lives today, his people (1 Corinthians 3:16-17)? If we follow the mock trial of Jesus, the false basis of his execution was rooted in his clearing the Temple and the following events; he was accused of blaspheming the Temple. Of course, we know that was not true. Jesus was "done in" by his holy passion for God's business and God's house. So let me ask you again, what is your passion? Life without passion is flat and boring. Life with the wrong passion is dissipated on destructive pursuits. But when life is built around godly passion, it leaves a permanent impact. What's your passion? Father, give me a fervent passion for your people, your work, and your Kingdom. Through your Holy Spirit, stoke the fires of my heart to live with a holy passion for you and your people. In Jesus' name. Amen.